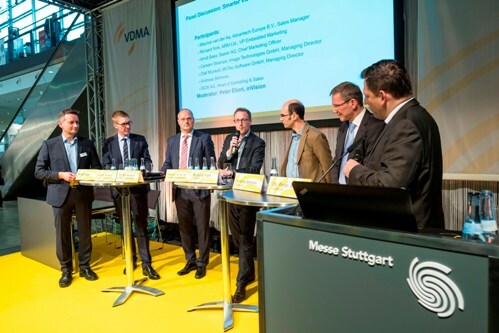 Embedded computing is transforming how imaging devices are deployed, but factory automation won’t be the quickest to take up the technology, were two of the comments made during a VDMA panel discussion on embedded imaging at Vision 2016 in Stuttgart, Germany. Embedded vision was one of the hot topics at the machine vision trade fair, which took place from 8 to 10 November, with companies including Basler, Sick, MVTec, Imago Technologies, and many others presenting solutions in this space. But Arndt Bake, chief marketing officer at Basler, warned that classic factory automation will be slow to adopt embedded imaging because of the nature of the market, where products must have lifetimes of at least five years and be robust enough to run continuously in industrial environments. Dr Olaf Munkelt, managing director of MVTec Software, agreed, commenting that he’d seen many high-speed camera systems on display at the show, outputting large amounts of data, which don’t lend themselves to embedded devices. He said there are still many applications addressed by PC-based systems. That said, embedded technology costs much less to develop and deploy than traditional machine vision. This opens new markets for imaging, areas like the retail sector where clever image processing algorithms for people detection and face recognition are allowing shops to collect much more data about their customers. Basler was demonstrating a smart imaging device developed by one of its customers for the retail sector, which not only recognised faces, but gave an approximation of the person’s age (it put me as being a few years younger than I actually am). Point Grey also had people counting technology on display for the retail market – it purchased assets of Nomi earlier in the year, including the Brickstream 2D and 3D stereovision people tracking hardware, which will now be transferred to Flir following the thermal imaging giant buying Point Grey in October. Embedded vision is a shift to much smaller devices with lower power consumption, implementing vision algorithms onto Arm chips or on boards containing FPGAs. ‘It’s transforming technology that’s PC-based into something that’s multifaceted. It’s an evolution,’ Richard York, VP embedded marketing at Arm, said during the VDMA panel discussion. What are needed, especially for the industrial sector, are standards. Munkelt said that there are many options to choose from for designing an embedded vision device, and that, in industry, engineers are often more comfortable working on a PC. However, Carsten Strampe, managing director of Imago Technologies, which designs and builds embedded vision components, added that it depends on an engineer’s background, that some developers prefer working with Arm platforms over PCs, and that FPGA programmers, while rare in machine vision, are more common in other areas. The vision industry is preparing for embedded processors with the GenICam 4.0 standard, hosted by the European Machine Vision Association (EMVA), which will support both traditional and embedded vision systems. Twenty four companies have indicated their initial interest. The EMVA will also run an embedded vision conference next year from 12 to 13 October 2017 in Stuttgart. There are two challenges that GenICam 4.0 will hope to address: the interface between a camera board and the processor, and the software API for smart cameras. Dr Fritz Dierks, chairman of the GenICam working group and director of platform development at Basler, said during the Vision trade fair that existing machine vision interface standards like Camera Link and USB3 Vision will add too much overhead to a system, making it more complex and costly. The GenICam 4.0 standard will probably work with the MIPI CSI interface, which is supplied with most embedded processors. Machine vision tends to be influenced by progress made in consumer markets – think of CMOS image sensor technology filtering down from mobile phones – and embedded vision is no different. The same can be said for image processing algorithms; machine learning is coming to the attention of the industrial vision community, and companies like Vidi Systems, shortlisted for the Vision Award, and MVTec were displaying software tools at Vision 2016 based on machine learning for industrial imaging. York at Arm commented during the show that machine learning is ‘going to change the face of this industry’. He pointed to the amount of investment being made in developing advanced driver assistance systems (ADAS) with machine learning technology. Munkelt said that deep learning is not the answer to everything, as it’s computationally expensive - MVTec's latest version of its Halcon software library includes an OCR algorithm based on deep learning, which gives a read rate two times faster than earlier OCR tools, but requires around 50 million images to cover all possible characters. York observed that image processing software will probably be a fusion of machine learning and standard tools in the future. However, York added that ‘those that ignore machine learning do so at their peril’. The move to embedded vision is now well underway. Basler has recently launched the Imaging Hub portal in collaboration with FPGA maker Xilinx as a platform for engineers to develop embedded imaging devices. Xilinx has also introduced its own online platform for developers building embedded vision devices. At the show, Xilinx listed industrial machine vision as an important market for its Zynq FPGA technology. The main area for embedded vision though for the FPGA firm is automotive – it has seen its ADAS unit shipments increase threefold in the last two years to 24 million units, with its FPGAs used in more than 80 models of car in 2016. It expects its vision system shipments be worth $350 billion over the next five years. 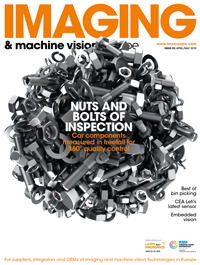 With such investment into embedded vision in the automotive sector, it’s hard to see how the industrial machine vision market won’t be affected. Factories might be slower to adopt the technology, but embedded image processing is only likely to grow.